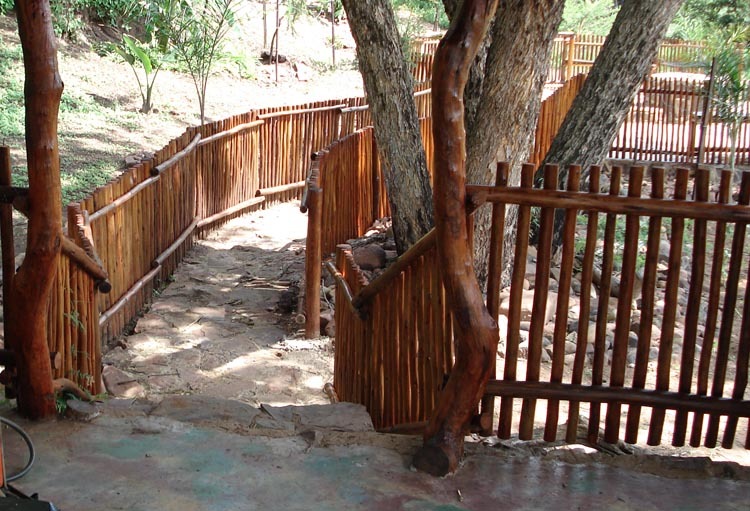 Our most popular jungle gym. 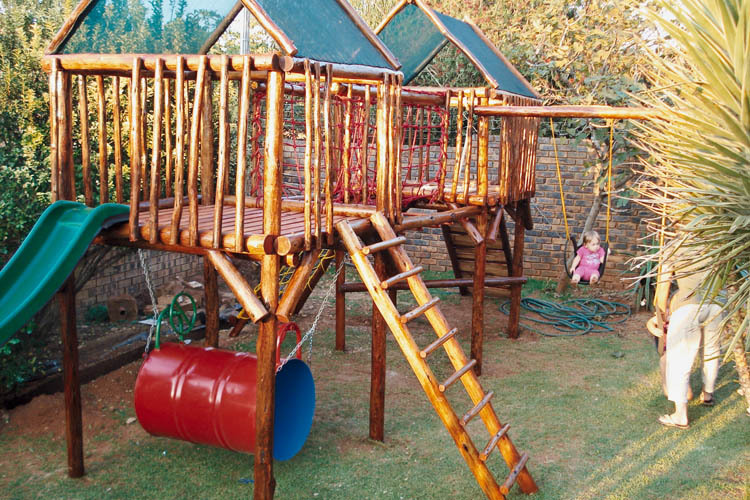 This jungle gym is also suited to homes where garden space is at a premium. 1 x 3m straight steel slide, choose between red, blue or green. Delivery and installation fee is not included. 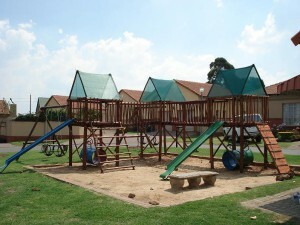 The same specifications as above, but without the slide. Delivery and installation fee not included. 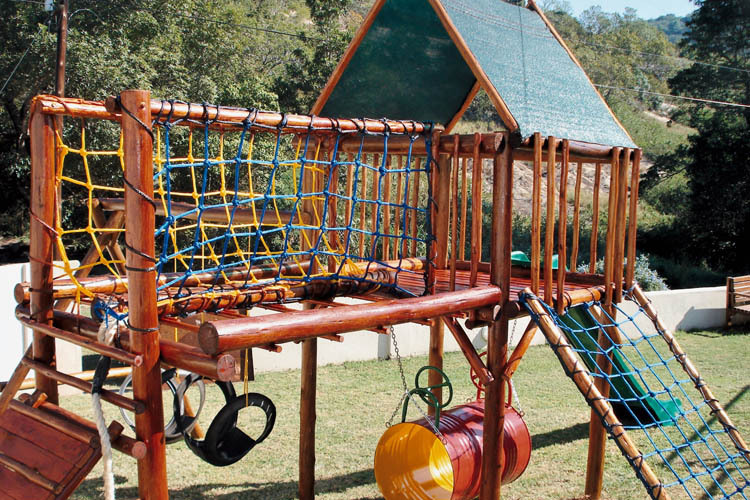 Much the same as the Standard Jungle Gym, but no swings and a few different components. 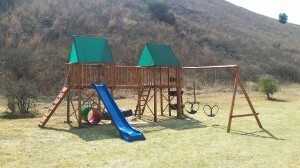 Although a 3m fibreglass slide is shown in photo, the price given includes a 3m straight steel slide. 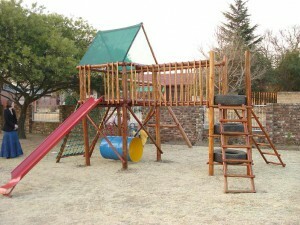 If a 3m fibreglass slide is requested, the price shown next to the jungle gym, would increase. This playground jungle gym, was installed at a Restaurant at Ilanga Mall in Mbombela. 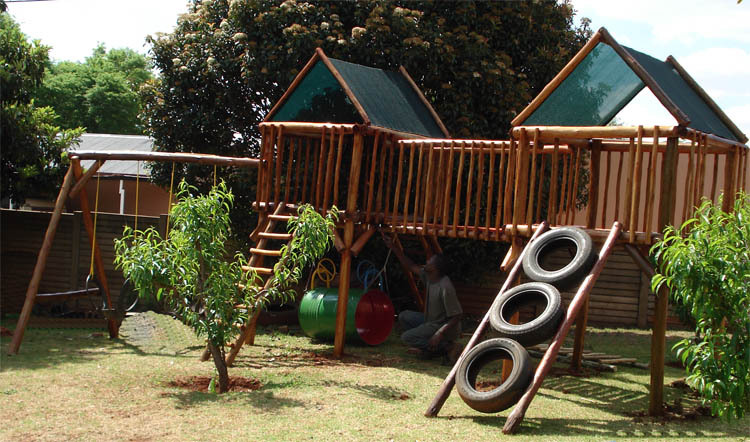 This playground jungle gym is suited to private homes, preschools, churches, hotels and so forth. 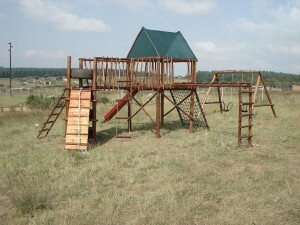 1 x 3m straight steel slide, choose between, red, blue or green. 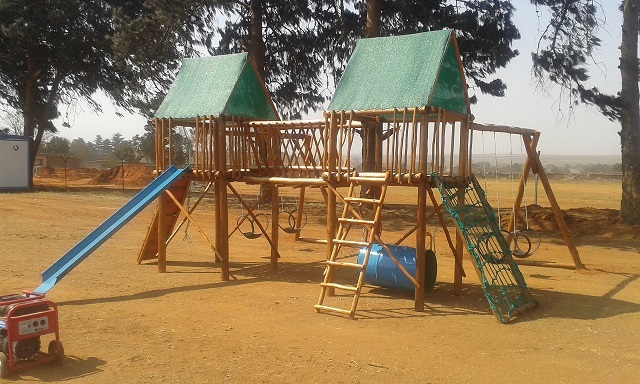 Suitable for security village home owners sharing playground space, preschools, primary schools, resorts etc, hours of fun will follow with this jungle gym. 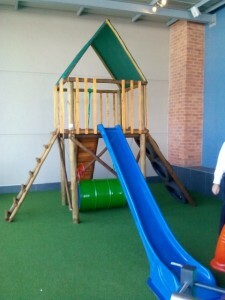 • 1 x 3m Straight Steel Slide, choose between red, blue or green. 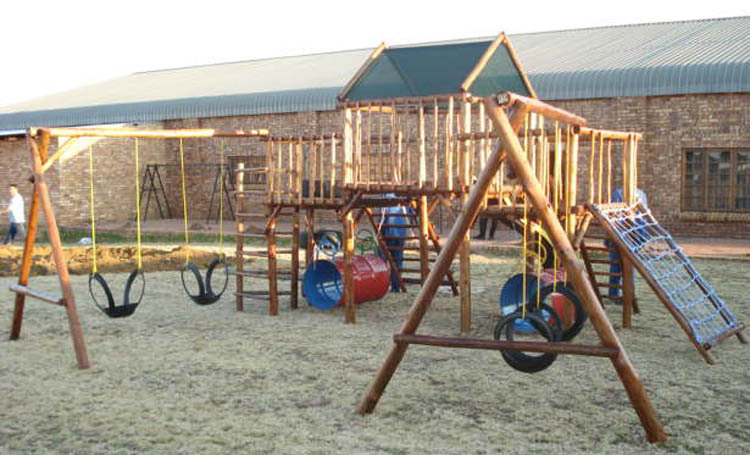 • 2 x Sets of 2 tyre swings each, mounted onto jungle gym. This price does not include the delivery and installation fee. This jungle gym is very popular with especially primary schools, party playgrounds, resorts and church playgrounds. 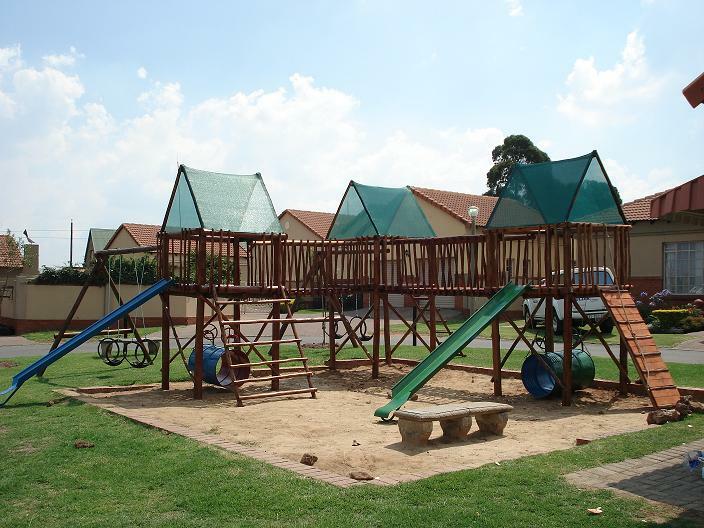 Rooftop a-frame height 1 – 1.2m. The middle platform has a 3m straight steel slide to the front, choose between red, blue or green. All three platforms are closed with lathes at the back. Height from ground to top 2.1m. 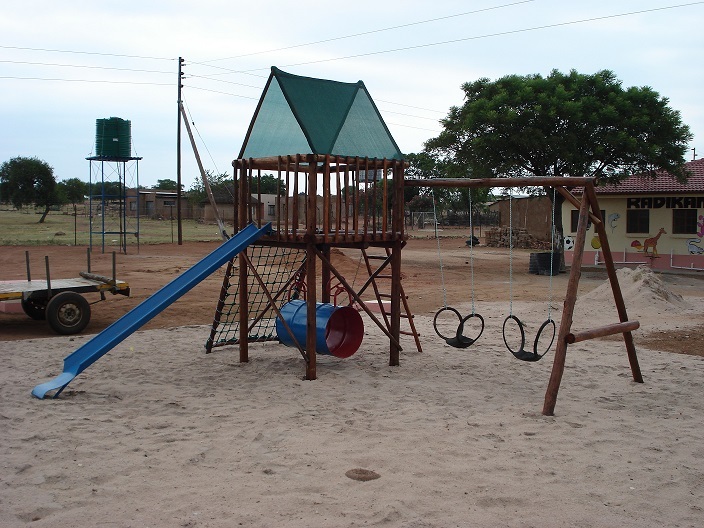 Also suitable for daycare, preschools, primary schools, resorts, complexes and church playgrounds. 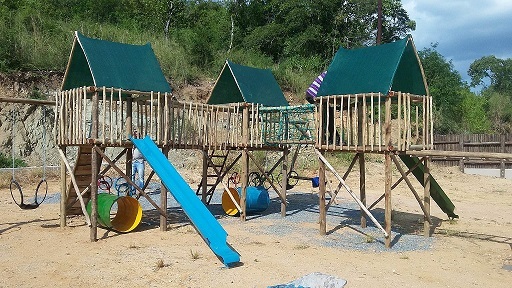 This and the Janine Jungle Gym hereafter are the ideal jungle gyms for teaching kids balancing skills, hand and eye co-ordination, as well as, providing loads of exercise. Components the same as above, except for lathes instead of cargo nets used around balancing pole. The sides of the balancing pole is covered with lathes. Lathes are more popular due to nets tending to sag over time. Nets are also much more expensive than lathes. Suitable for domestic homes, resorts, complexes and church playgrounds. 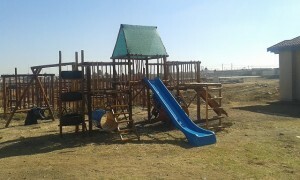 Ideal jungle gym for teaching kids balancing skills, hand and eye co-ordination, as well as, providing loads of exercise. To the front a 3m straight steel slide, choose between red, blue or green. Everything the same, but instead of cargo nets covering the balancing poles, some clients prefer to opt for wooden lathes instead. Also 3m steel slide used instead of fibreglass slide. 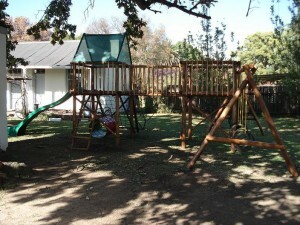 Very popular with private homes, preschools and resorts. The other platform has a ladder 1.8m long at the front. Please note: The tyre and sandpit not included in the price. Suitable for private home owners, preschools, primary schools, resorts etc, hours of fun will follow with this jungle gym designed to focus on balancing skills. • 1 x Set of 2 tyre swings mounted separately. 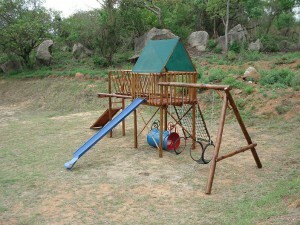 • 2 x Sets of 2 tyre swings mounted onto jungle gym. 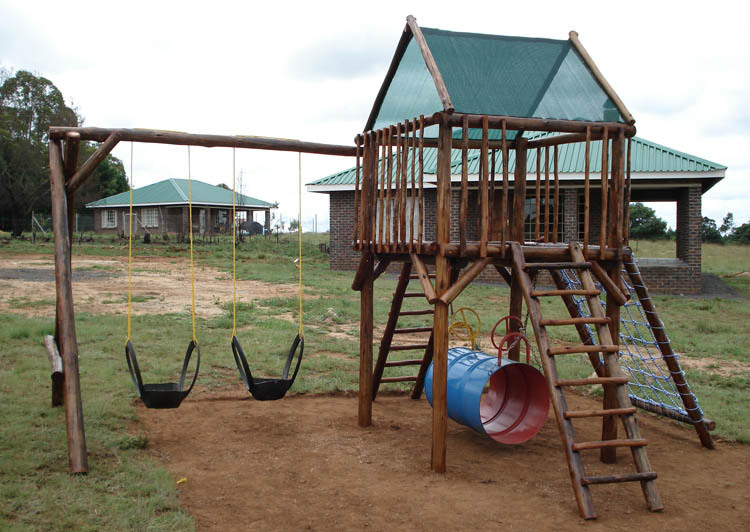 This playground jungle gym was erected at a school in Swaziland. with either cargo nets or lathes around. Monkey bars 1,8m long with ladder to ground, protrude from one side of one platform. Please Note: All platforms on jungle gyms are closed with lathes on the sides where there are no ladders, slides etc. This is also the case for bridges on jungle gyms. The client can include or leave out components as required. This must however, be confirmed beforehand.